It happens with every experienced gaming group. As Game Master, you can’t put your players up against a creature of appropriate CR without hearing them accurately estimating its AC, hp, and special defenses. Throw a high CR monster at them and you might be serving them XP on a silver platter or guaranteeing a Total Party Kill. It isn’t your fault. It isn’t your players’ fault either. Invariably a group that plays together a long time learns the game better. You can accept this and watch your encounters get decimated. You can move on to a different game, kissing your shelf of gaming books and the money you invested in them goodbye for now. Or, you can break out the secret weapons. Tyranny and Manipulation – A Game Master’s Secret Weapons, is a new weapon for your GMing arsenal. Featuring rules to change the landscape of every encounter, even your veteran players will be scrambling to keep up with your unpredictable challenges. Run encounters like never before using new base classes the shepherd and warmonger. Coordinate your assaults with the synergizing ruler and minion feats. Turn classic monsters into the unfamiliar threats with mutations. Unleash massive armies with the easy-to-use hordes template. All this and more that your players will never see coming, and they will thank you for it when you’re done. 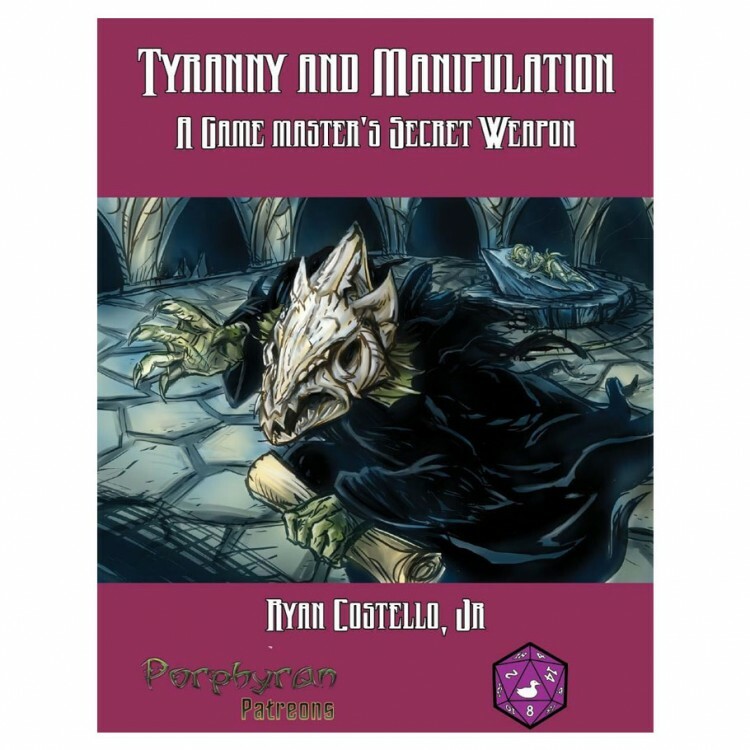 Tyranny & Manipulation includes: Two new base classes; Over 30 new archetypes; More than 75 new feats, including two new feat types; Over two dozen new spells; Mutations to literally remake classic monsters; Hazardous Environments, to turn your terrain into a whole new threat; A new template, Hordes. Combat with armies of enemies has never been simpler; Simplified versions of 17 base classes to cut down on prep time; All this plus easily implemented tips and tricks to intensify the experience around your game table.